BUTUAN City — As the demand for roses soared high this month, farmers from Claveria, Misamis Oriental, were hopeful to meet the demand from different parts of northern Mindanao in time for the Valentine’s Day celebration today. “Right now, we can only harvest thrice a week,” said Al Gamas, 31, owner of a flower plantation in Barangay Mat-i, Claveria town in Misamis Oriental. Gamas said they were exerting more effort to harvest 2,000 to 4,000 dozen roses before today’s celebration. He was confident that they would be able to meet the demands, citing orders from Cagayan de Oro City, Gingoog City, Butuan City and other areas in northern Mindanao. One flower vendor in Cagayan de Oro alone, for instance, ordered from Gamas 500 to 800 dozen roses. Gamas said their clients had to order ahead because of the demand. “The industry has grown so much, and I’m sure that this year, most farmers here can meet the demands from sellers,” he said. Farmers in Claveria said the prices of roses went up to as much as P300 to P400 pesos a dozen from P15 to P20 before February. 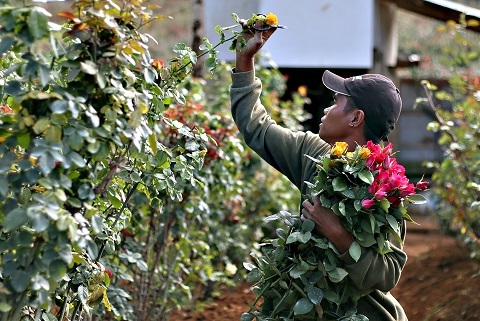 “The flower industry of Claveria has steadily expanded. It started a few years ago in Barangay Gumaod. Now, it has reached and expanded to a large portion of Barangay Mat-i and also in a small area in Barangay Lanise,” said Pat Domaloan, municipal agriculturist. In Mat-i, some 10 hectares have been turned into a rose plantation, said Domaloan. He said the town government hopes to provide assistance to the farmers by way of trainings and a loan program.